Jackie Fo: Blogger Meet up and Football Dips ands Tricks! Just coming up for air here...busy short week with work and a wedding I'm coordinating this weekend, but I did want to do a quick post about my very first face-to-face Blogger meet-up! For those of you that are unfamiliar with the big, mysterious blogging world, I want to share a little secret. There is no doubt that blogging is "brave." Putting yourself out there on the world wide web, with your thoughts, grammatical errors and photos for all to see can be scary. In fact, that first time you hit "Publish Post," is downright frightening. Here's the secret though...I'm sort of hiding behind my computer. I can email and tweet and Facebook and Blog until I'm blue in the face, but I'm still behind my protective laptop shield! Not that I am afraid to talk to people in person, in fact, it's quite the opposite. BUT. My overall rambling and slightly over thought point is that while blogging is brave, meeting one of your blog friends is even braver. Because seriously, what if he/she hates me when I am NOT behind said protective shield! What if our funny email banter doesn't translate to the real world? So you be the judge...did Jess from Party Box Design and I get along? Uh yea.......... I think we did! Jess is awesome! We got along like peas and carrots, or my personal favorite, wine and cheese. She is just a sweet as you might imagine, and one helluva good time! Her husband is so nice - and has an impressive head of hair on him, just thought you should know that. And her sweet daughter? OMG! What a hilarious, adorable child! First blogger meet up = success! To celebrate tonight's first official NFL game, why don't you check out my Football Dips & Tricks article posted on Tablespoon. 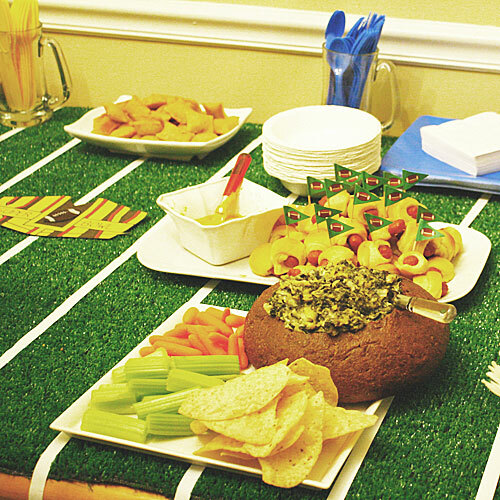 It's full of fatty, cheesy dips and decor ideas for making your football party the absolute cutest and unhealthiest it can be. Are you ready for some football? And pumpkin flavored everything? And cooler weather? This gal is. Hope you're having a GREAT week! So if we hang out, does that count as a blogger meet up? So glad you two had a great time together! I have yet to meet-up with any other bloggers...the thought is both frightening and exciting at the same time! Hope you enjoy the game tonight...yay Fall!